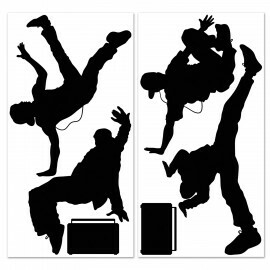 Insta-Theme Break Dancers & Boombox 80's Props Plastic Silhouettes - Indoor or Outdoor Use Dancers 95cm - 1.3m & Boomboxes 35cm. 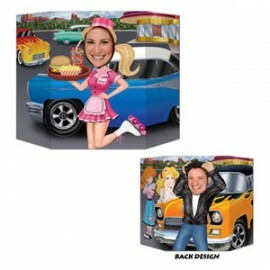 Props will require scissors to cut out figures Each..
Photo Prop Arcade Game 80's (94cm x 64cm) Cardboard (Not suitable for Express Post due to size of product) Each..
Photo Prop Car Hop / Greaser (1 side car hop, other side greaser. 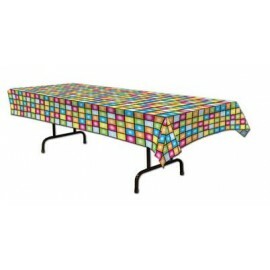 Printed 2 sides w/different designs) (Not suitable for express Post due to size of product) Each..
Tablecover Disco Squares Plastic 137cm x 274cm Each..